Ask a startup how they generate new customers and, chances are, they'll talk in terms of marketing qualified leads and sales qualified leads. Marketing qualified leads (or MQLs) are website visitors who have the potential to become great customers: they've actively engaged with your company, and they look like a good fit for getting value from your product. Sales qualified leads (or SQLs) have gone a step further, taking an action that suggests a willingness to actually buy from you. Thankfully, there's another way—a qualification framework that generates active, engaged leads that require less effort to close and make better long-term customers. 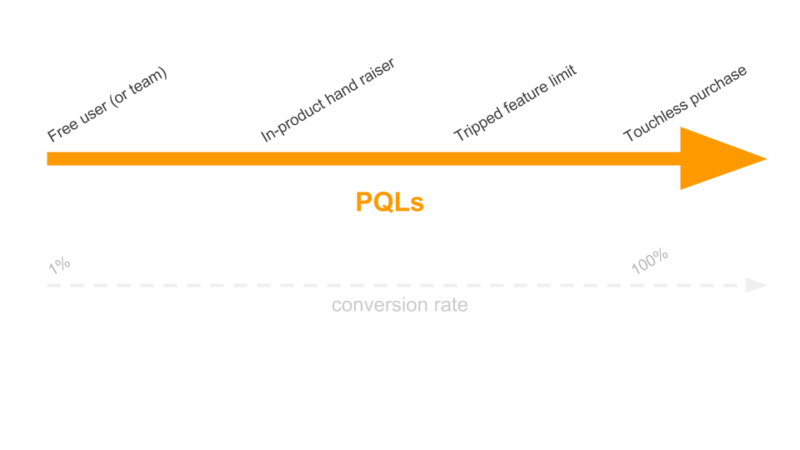 Instead of MQLs and SQLs, we need to start talking about PQLs—product qualified leads. When a lead becomes marketing or sales qualified, we're using their interactions with our website—downloading an eGuide, viewing a pricing page, or submitting a contact form—to predict when they're ready to buy. This, in turn, allows you to identify when leads become sales-ready with much greater accuracy. Instead of relying on a proxy of sales readiness, it's possible to see how users actually engage with your product. It works by identifying actions that show users have explored the product and received enough value that they're ready for a sales conversation. Product qualified leads are also much easier to turn into customers. The MQL/SQL framework puts the cart before the horse, selling to users before they've successfully adopted the product. Sales reps need to do more education and persuasion before a sale, and customer success reps have to work harder to ensure adoption afterwards. By definition, product qualified leads have already adopted your product. They understand how it works, and they're getting value from it. As a result, the sales process is little more than a formality. In fact, PQLs close customers at 6x the rate of SQLs, according to Redpoint Ventures partner Tomasz Tunguz. At that 2,000 message milestone, a typical team of 10 people has used Slack for a week. They've experienced the product's core features—quick collaboration, fewer email exchanges, rapid file sharing—and seen firsthand the impact Slack could have on their long-term productivity. Once a team has hit that milestone, they have a 93% retention rate. Using a tool like MadKudu, these behavioral triggers can be combined with demographic data—looking both at customer fit and likelihood to buy—to fully automate the lead qualification process. 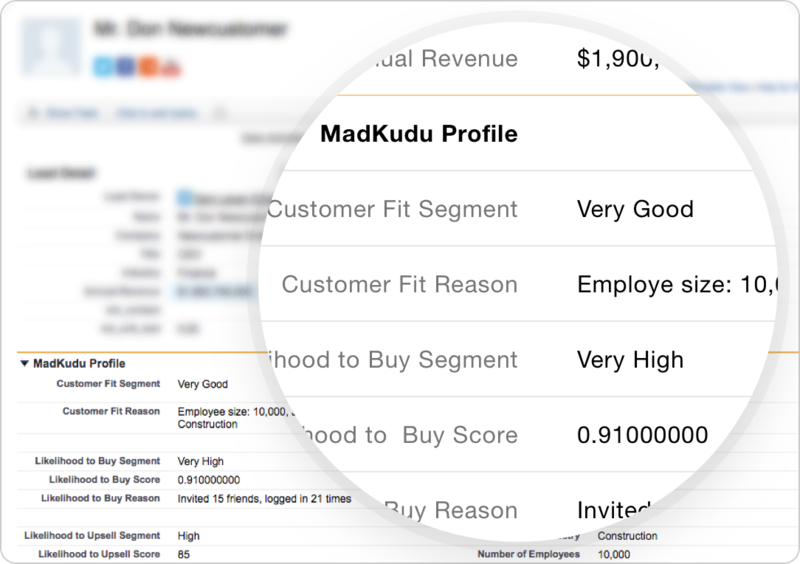 Pushing the MadKudu score to sales tools like Salesforce allows sales reps to view a detailed breakdown of every lead's current qualification status, while allowing Ops teams to prioritize lead routing as well. For a company that generates thousands of leads, it isn't always enough to have a binary, qualified/unqualified system. You also need a way to prioritize following up with those leads. At one end of the spectrum, we have a free user who has triggered our PQL criteria, completing an action like sending 2,000 messages or submitting 10 invoices. Though this user has experienced the core value of our product, there's no guarantee they're ready to buy: they might be happy sticking to our free plan. Of all our PQLs, these users will require the most sales involvement to become customers: they need to be persuaded that a paid plan is significantly more valuable than the free plan they're currently using. Most companies define “Hand raisers” as PQLs who have filled out a contact form to explicitly ask for sales support. They're more sales-ready than other free users but might still require a few sales touches to convert. Instead of trying to persuade someone to purchase a product they've never used, you're helping them get more value from a product they already love. 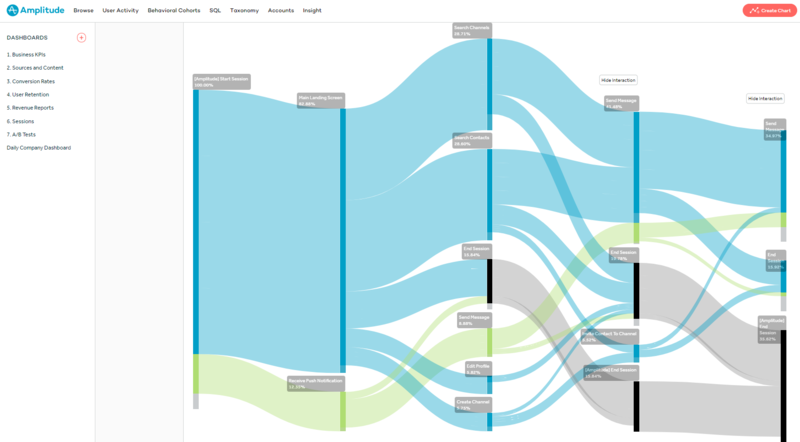 Instead of guessing their needs from a contact form submission or the pages they've visited on your website, you can actually see how they're using your product and shape your sales process to match. You can find a lead's most-used product feature and talk through the extra functionality that comes with a paid plan. You can dig into the limitations they've hit on their free package and help them choose a tailor-made plan that matches how they actually use your product. By switching to PQLs, you're no longer reliant on slick sales patter to close deals. You're letting your product—the heart of your business, and the reason your customers part with their money each month—sell itself. Product qualification isn't just a way to speed up sales and improve conversion rates. By using in-app engagement as your primary qualification metric, you're making a clear, unequivocal declaration: customer experience comes before customer revenue. Instead of focusing your energy on selling a product to people who have never used it, you're offering a great product experience, up front, and using the strength of your product to sell itself. You're using your sales team to support the product and making product adoption your number one priority. You're generating leads that are easier to close—and most importantly—creating customers who are guaranteed to get value from your product.